The biggest reason we exist as a platform is to be a space for women to share their voices and stories. We fully believe that if more women’s stories were shared widely and became cultural and social norms, it would go a long way toward better policies and attitudes around gender equality. When we come across badass women who are forging new ground and inspiring those around them, it reminds us why we get up every day and do the work we do, knowing these women are leading the way. One of these women is Jessica Nguyen, a California-based entrepreneur, wife and mother who is about to launch her own business in a very male-dominated industry. Her background as a former single mother and immigrant, whose first language was not English, shows what happens when people are given opportunities to succeed. 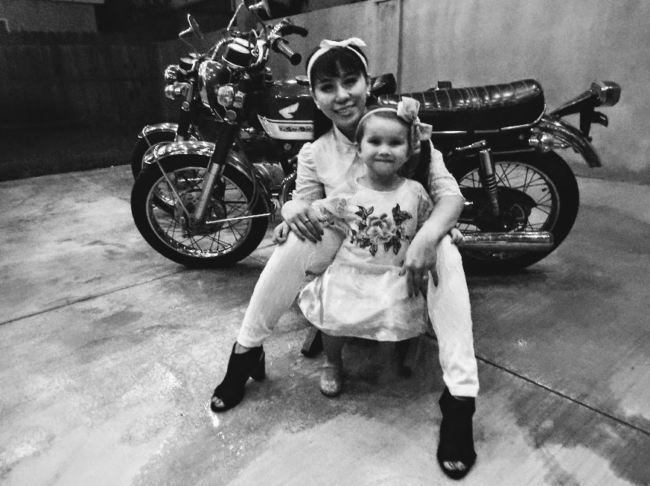 In 2004 Tanya Le and her daughter Jessica Nguyen said goodbye to friends and family in Can Tho, Vietnam and moved to the United States to join Jessica’s grandmother and grandfather who were political refugees following the Fall of Saigon in 1975. As a child, Tanya witnessed the bravery, heroism and sacrifice of America’s military soldiers during the Vietnam War. It is something she will never forget and always hoped to find a way to pay them back, even in some small way. 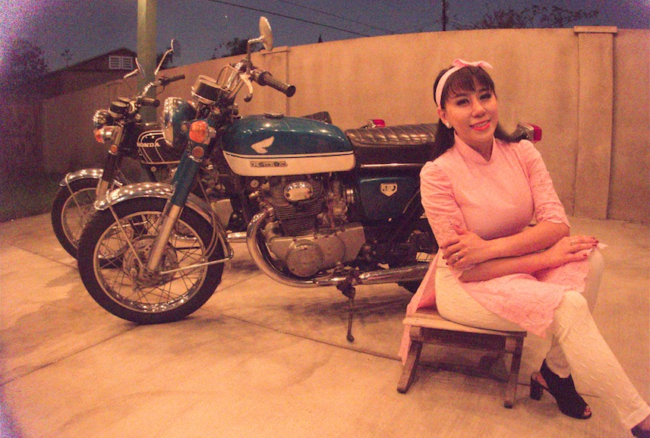 Today she is the founder of a fledgling small business focused on services for motorcycle restorers called MotoVisa. It is a woman and minority owned business providing wet blasting for vintage motorcycle parts. The company will also have an important charitable component: Jessica and her husband are restoring a vintage bike which will go up for sale and the proceeds will be donated to R.I.S.E – a program within the Gary Sinise Foundation helping wounded veterans find housing. 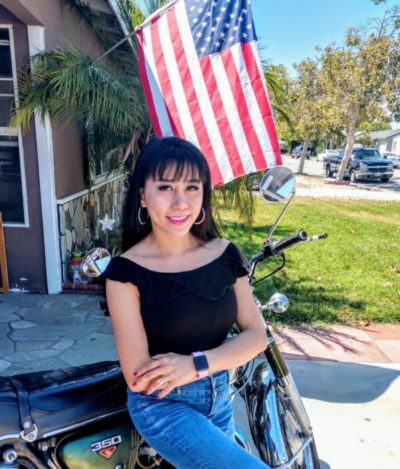 Unlike the route most traditional business owners take by getting a business loan, Jessica is going to raise start up capital with a t-shirt fundraising campaign. We wanted to help her promote her campaign and learn more about her mission, which you can read about below. I am a TV news and show host for a Vietnamese station in Westminster. I have a second job as an MC at a very popular Karaoke bar in Little Saigon. One of my passions is singing. In high school I worked as a professional singer working in bars and restaurants in my hometown, Can Tho, Vietnam. Working in the Karaoke bar allows me to keep singing and I love it. I am a mother to an 11 year old boy and a 2 year old girl (Tony and Jaden). My mother and I have taken care of each other our entire lives. She was very young when she had me and I was young when I had my son. We’ve been through everything together and our mutual strength has helped us have a happy life. What are your proudest achievements in life? Being a single Mom when I was only 22 empowered me to pursue my dreams. I had only been living in the U.S. for less than 2 years. I was working in a nail salon and had a 1 year old boy when my ex-husband left me and went back to Vietnam. I became extremely determined to give my young son the best possible life I could. I enrolled in an ESL class at Goldenwest College in Huntington Beach and 6 years later I graduated from Cal State Fullerton. It taught me that I controlled my future and I could do anything under any circumstance. Why did you decide to try to start a business? My husband took me and my daughter to a classic car show in Los Angeles about 6 months ago. We met the owner of a company called Vapor Honing Technologies that manufacturers Vapor Honing cabinets. My husband took some of his vintage motorcycle parts and we got to use the machines that were set-up at the show. I fell in love with the process of taking these old ugly parts and making them beautiful again. I researched the companies that offer vapor honing or wet blasting services and found out that it is a male dominated industry. I thought there was a good business opportunity. What I wasn’t thinking was, “women aren’t welcome in this market” I thought, “I see an opportunity in this market”. I see many women in my Vietnamese community who own their own business and are amazingly successful. I know many of these women and they encouraged me to go for it. I also have a strong and smart mother. She owned a restaurant when we lived in Vietnam and was very successful. I learned a lot from her hardwork and determination. Why are you doing a t-shirt fundraiser and how much do you hope to raise? I don’t have all of the money right now to buy the vapor honing equipment and the compressor to run the machine. My husband and I created the logo for MotoVisa and I thought selling t-shirts with the logo would be a good way to raise some start-up capital. We researched it and found out there are a few online companies offering fundraising services helping people sell the t-shirts. The t-shirt company we are partnering with (Bonfire) takes the t-shirt orders online and fulfills the orders once the fundraiser is complete. I hope to raise around $7,500 and the rest of the money I need to start MotoVisa will come from my savings. The equipment will cost about $15,000.00. We also have to build a quality e-commerce website and do some marketing. In the beginning MotoVisa will be a home based business. I hope to someday have a commercial location and maybe even be able to offer locals the ability to visit our shop and offer DIY Vapor Honing. Why does MotoVisa have a charitable component? My Mom grew up in Vietnam in the late ‘60s and early ‘70s. She had a lot of experiences with American military soldiers in her hometown. They were good to the people in her hometown and good to her Father who was a military soldier for the south Vietnamese army. My grandfather was captured by the North Vietnamese army after 1975. He escaped and over several years and great difficulty made it to America. America took my grandparents in and gave them an opportunity to have a good life. Eventually my aunt, uncle and mother and I were allowed to come to America. We will never forget the goodness of the American people and the opportunity we have all been given. My Mother and I watched a video about the Gary Sinise Foundation and their program called R.I.S.E. 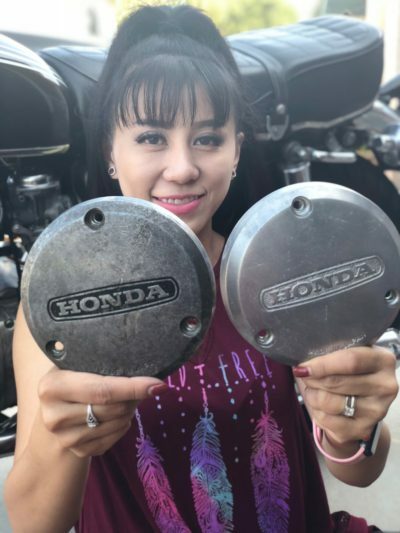 We thought it would be good if our business could contribute to this program and that’s basically how we came up with The Vintage Motorcycle Program. 100% of the money we generate will benefit the Gary Sinise Foundations’ R.I.S.E. program. My husband is going to donate his 1971 CB350 to The Vintage Motorcycle Program as the first motorcycle that will be restored and sold. 100% of the proceeds from the sale will benefit the Gary Sinise Foundation’s R.I.S.E. program. He loves that motorcycle but he wants to support me as much as he can. He will also help me on weekends with the vapor honing work. Who designed your logo for MotoVisa? It was a collaboration with my husband. Since he is donating his ‘71 motorcycle as the first bike to be restored for The Vintage Motorcycle Restoration Project, I wanted his generosity and support for me and the program to be reflected in the logo so it is the bike I used for the image on the logo. What advice would you give other women who want to start their own company or do something really challenging? Don’t ever be ashamed to ask for help or guidance. It’s not a weakness asking for help…It’s actually a strength. It’s OK to be afraid of taking on a challenge but never let fear prevent you from doing your research, asking for help or guidance and then make an informed decision to take on that challenge. If all we ever did were things that felt comfortable it wouldn’t be very much fun and it certainly wouldn’t be rewarding. Failure is more rewarding than not trying. In fact, I’m asking for people’s help right now. 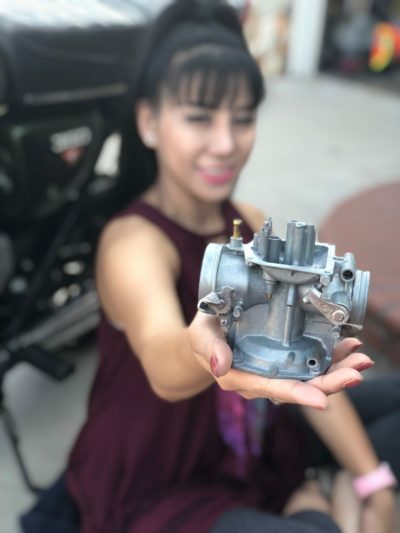 I am asking people I know and don’t know to buy some t-shirts so I can raise a small amount of capital to start a business and pay it forward with The Vintage Motorcycle Project. I think people will appreciate knowing the shirt I am asking them to buy has purpose and value. It has a logo that is meaningful and represents someone who has some fear about starting a business but the courage to do it and ask for some help. Millions of people buy t-shirts with the Nike logo on it. What does that mean to them? 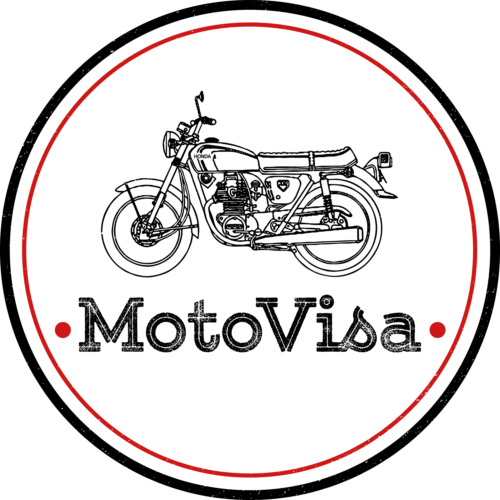 The MotoVisa logo means they helped someone out and maybe one day they will find out MotoVisa became a successful company and they can be proud that they helped the owner get started. Or they can buy the Nike t-shirt and know they helped a big corporation make more money. When will your campaign end allowing you to open MotoVisa for business? The t-shirt campaign ends August 31st. After that I will buy the equipment I need and get an electrician to get it all installed and operational. At the same time I will be building the website, getting the business license and create a marketing strategy. I would like to be open for business by October 1st, 2018. People can sign-up on motovisa.com and get 10% off their first order. They don’t need to buy a t-shirt they just need to sign-up. But please buy a t-shirt! What else can people have vapor honed if they aren’t restoring a motorcycle or a car? Anything that is metal that needs to be cleaned up and look nearly new. Old metal furniture, decorative metal objects and hardware, metal light fixtures and even 3D printed parts made with titanium. There’s a big long list on our website www.motovisa.com. Where can people go if they want to buy a t-shirt? They can visit the website to make a purchase. There are three available styles, 2 tees and a tank-top and many different color options. The two t-shirts (one is crew neck and one is V-neck) are Next Level 60/40 cotton/poly blend. It’s my favorite t-shirt fabric because they are very soft. I could have picked a less expensive fabric but I want people to really like the shirts.